For as long as I can remember, my mother has been making things by hand. Quilts and pillow covers, pottery bowls and macramé wall hangings, wax candles molded in milk cartons and hand soap derived from bacon grease. As a child, I tried to keep up, following her around like a miniature sous chef of all things craft, but she never seemed to want much help. Crafting was her meditation. She would go quiet as she sat pushing strips of fabric under the fast-charging needle of the beige Singer sewing machine, which rose from our dining room table like a shipwreck. Around her, chaos swirled. My father left to marry another woman. Laundry, dishes, and bills piled up. Our basement flooded to our shins every April, and our car broke down when it snowed. My two teenage brothers dabbled in things that teenage brothers dabble in, while I dove head first into books. My mother’s first job, as a temporary secretary, meant she had little energy for a young girl craving attention. I couldn’t blame her. But several years after that time, things took a darker turn. One of my brothers was diagnosed with bipolar disorder and dropped out of college to move back home. Doctors tried — and failed — to treat him, and my mother plunged into a deep sadness in the face of his illness. In the middle of eleventh grade I decided I had to save myself. I told my mother I was leaving her and my brother in Arkansas to live with my father and his new family up in Massachusetts. In hindsight, I know the move was necessary, but I still look back on that time and can’t believe I boarded the plane and flew away. I loved my mother and here I was abandoning her — would we ever be the same? Three years later, my brother committed suicide, and the guilt of having left grew stronger still. I was in college on the East coast by then, and I spent the next summer living with my mother, hoping to find something of what we’d lost. But our lives felt forever fractured. It wasn’t until ten years later, when I got engaged, that I thought of my mother’s sewing again. I called to ask her if she could stitch together an important part of our wedding ceremony: a huppah, or Jewish canopy. It must have seemed an odd request. I had been raised Presbyterian but had left religion. Michael, my fiancé, was raised Jewish but no longer practiced. And yet the huppah, according to tradition, represented something we both craved: a new home. Both of Michael’s parents had died in separate, untimely deaths, including a fire that destroyed the house he grew up in. Like me, he was well versed in loss. When I explained what a huppah was to my mother over the phone, I was standing in our apartment in northern California, a thousand miles away from her. I told her we could collect swatches of fabrics from our wedding guests and asked if she might consider sewing them into a single tapestry. “It could be like one of your quilts,” I added. “Let me think about it,” she said before we hung up as we always did, without much fanfare. The idea combined Michael’s Jewish background with my own southern heritage. I drafted a letter to our guests asking if each could provide a fabric swatch and sent the letters out with an empty, stamped envelope addressed to my mother in Arkansas. When I arrived in Arkansas, two weeks before the wedding, the huppah was partially assembled and draped over the wooden table in my mother’s small kitchen. 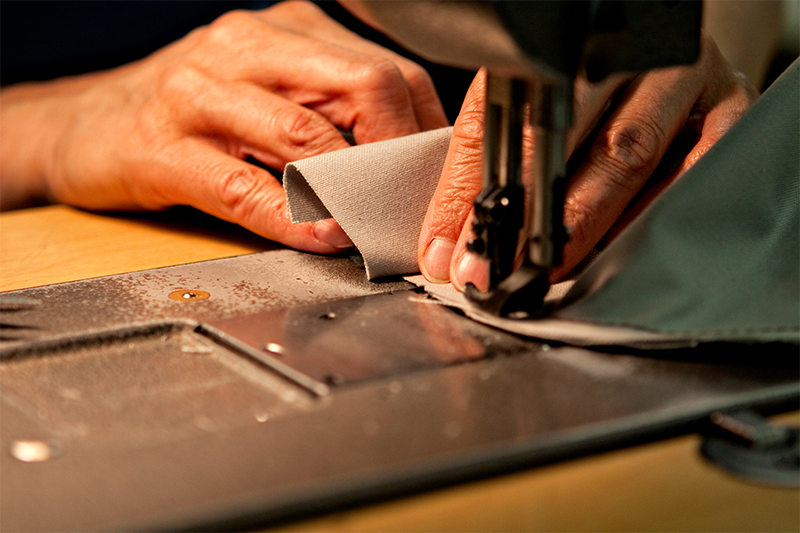 She had decided to sew the seams with intricate stitches in metallic thread but had only begun to do so. We had just two weeks to finish. And so, that night, I sat down beside my mother and—our needles threaded with gleaming gold—she taught me how to sew. Soon I was making French knots, feather stitches, and long, graceful chevrons. 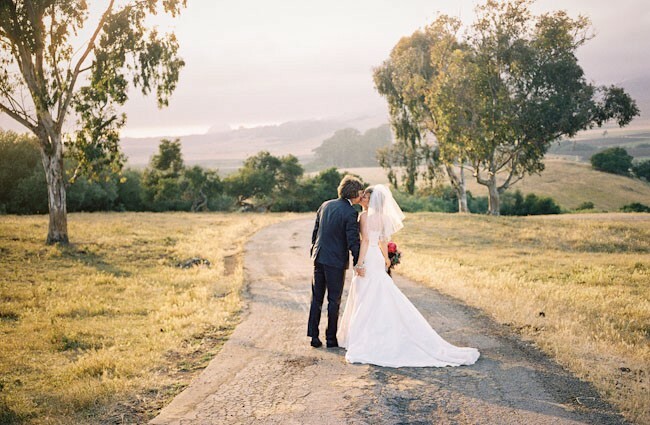 By day, over the next two weeks, I raced to hair appointments, caterers’ tastings, and our wedding venue on the edge of town. But when night fell, my mother and I would pour ourselves two big glasses of wine and set to stitching. Originally, I had imagined the huppah as an attempt to create deeper spiritual meaning in our otherwise secular wedding ceremony. But on those nights with my mother I began to realize that what we were really mending was ourselves. Fifteen years since my wedding day, the crazy-quilt-huppah hangs in the hallway of the house Michael and I share with our three children. I walk past it several times a day when I head to the kids’ rooms to make sure they’re doing homework or getting ready for bed. Sometimes when I brush past the rich, gorgeous tapestry, I practically weep with gratitude for what we made, not just the huppah, but this life. Fifteen years on, those gold threads are still gleaming. 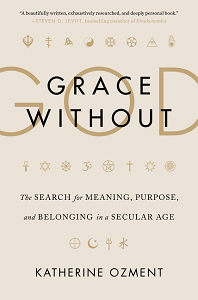 Katherine Ozment is the author of Grace Without God: The Search for Meaning, Purpose, and Belonging in a Secular Age published by HarperWave June 21, 2016. Available for purchase at Amazon, BN.com, Books-a-million, and Indiebound. Author of forthcoming Grace Without God: The Search for Meaning, Purpose and Belonging in a Secular Age (Harper Wave, 2016).